Marc C. of Flower Mound, Texas built this incredible lap steel using the empty coffin case of an old violin. Note the beautiful scroll headstock, the classic F-holes, lipstick tube pickup and violin tailpiece. Got questions or comments? Leave them here. The Dude abides... and gets to play a OneSixTwo cigar box guitar. Cool plans discovered in a 1960's Popular Science magazine. Build your own solidbody electric bass from a standard 2x4!!! Photo Feature on the Budrows in Concert, (http://thebudrows.com) a 3 piece cigar box guitar/washboard/harp band from Anaheim CA. Photos include close-ups of the instruments and more. CigarBoxGuitar.com. These vids by performer "One-hand" Dan Russell are a great introduction to these amazingly fun and easy-to-play instruments. We'll be adding more CBU (Cigar Box Ukulele) content in the days ahead, so stay tuned! 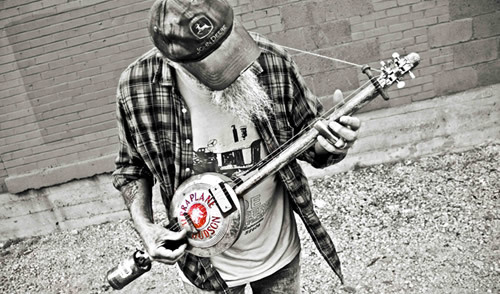 One of the most popular discussions this week is about building Hubcap Guitars just like the ones played by Seasick Steve. Want some ideas to make your own? Got some tips to share? Join the discussion about Hubcap Guitars! Sponsored Message: Be sure to check out the entire line of Fretting Supplies at CBGitty.com.